UPDATE AUGUST 2, 2018: An early-draft OWNER’S MANUAL is now posted publicly at this certification link. However, it nearly amounts to a placemarker for any Android phone, written to meet the minimum requirements for certification. 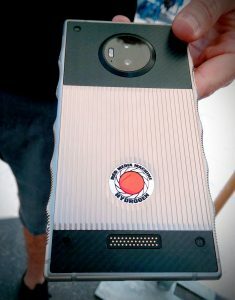 The RED Hydrogen One is a $1.2k Android phone that displays a bit of three-dimensional depth in its medium-brightness display, without any need for 3D glasses. If you read no further, this basically sums up what the Hydrogen will bring to a complicated, carrier-driven marketplace of smartphones this year. I was an early adopter of the LG Optimus 3D smartphone way back in 2011, and we’ve since seen the Nintendo 3DS gaming systems too; so in my mind, this is really round three of portable 3D tech. If there’s a theme worth promoting here, it’s all about managing expectations: honestly, the best you can do for comparison, is to dig into your childhood memories and remember those 3D books showing just a hint of depth whenever you’d shift the angle a little, as seen in this two-frame animated GIF that I shot while visiting my folks in California, pulled from what’s left of my childhood library! 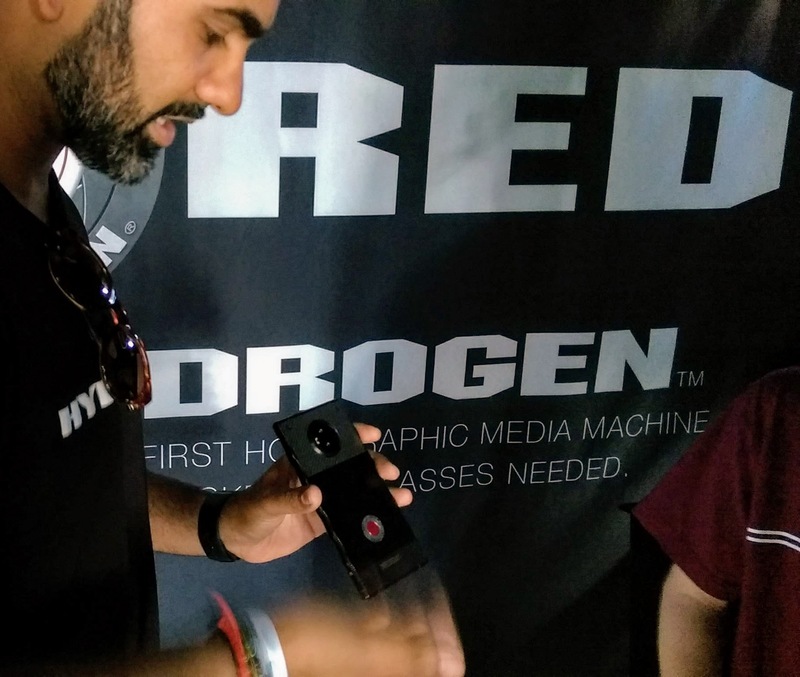 Early reviews of the Hydrogen have been trickling into public view, after a couple of limited hands-on demos, but on June 3, while attending AT&T Shape 2018 as a filmmaker at Warner Bros Studios, I got a hands-on test upon entering RED’s mobile tent, seen here. That was cool; but what happened just after leaving the tent, was totally rad. (Visiting southern California brings back my upbringing’s 20th century surf dude vernacular.) Sitting at an adjacent picnic table on the Warner Bros. lot was Jim Jannard, founder of RED (and Oakley, which he sported in matching eyewear and apparel). He told me that he’s camera-shy, so I’m not posting his picture here, but we started off with something in common: I grew up in Irvine, California, attending high school and college there, which is also Jim’s base of operations. I’ve always been reticent about the RED ecosystem, famously stocked with near-fanatical user discipleship, evidenced at the RED forums where Jim has gained a reputation for straight-shooting in short messages that frequently ruffle feathers (but mostly receive instantaneous hordes of fan support). So what surprised me from the start, was his gentle and friendly way of expressing his enthusiasm, and openness to conversation with little me. He’s a really nice guy, the opposite of an East Coast entrepreneur, while he has managed to build an aggressive empire far outside the legacy system of Far East manufacturers and vendors (which reminds me a lot of his wild west counterpart down under, Blackmagic Design). Basically, RED can afford to take this risk as a newcomer to this complicated market sector, going rogue on a mobile technology and media format that absolutely won’t bring them a quick payoff. This thing will take time. After emerging from the tent, what I stood to gain from the man himself were some finer points for filmmakers that haven’t been reported by other writers in the general tech world. Let’s start with that stuff, distilling about ten minutes of one-on-one conversation, then I’ll wrap up with my hands-on impressions. Important clarification: the Hydrogen isn’t out yet, so features may change in the next few months. Will the internal cameras at launch time shoot with any kind of log color profile, to extend dynamic range and protect highlights? Any chance of 10-bit 4:2:2 into a durable, high-bitrate codec? Any optical image stabilization or lens adapter capability? 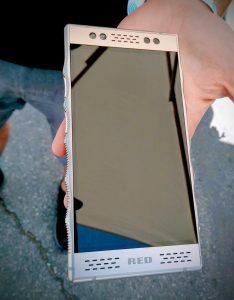 Jim didn’t specifically deny that there will be a log profile at launch, but overall emphasized that when it comes to the internal camera especially, RED is developing it for mass-market consumer expectations, and it won’t perform any differently in 2D than today’s other top-of-the-line smartphone cameras. I think he would have confirmed those capture specs I asked him about, if they were planned for launch, so we can expect none such prosumer/professional video features from the internal camera and its pertaining capture software. It remains to be seen whether the imaging can be exploited by third-party Android app developers, such as FiLMiC Pro that actually does empower smartphone cameras to shoot in a form of log color, at somewhat higher quality than their default severely compressed video codecs. Jim averred that the design of the Hydrogen would be compromised if they incorporated even a 1-inch sensor (and that’s smaller even than Micro Four Thirds, while on the other hand, my tiny Sony RX0 has got a 1-inch sensor). Then there needs to be two each for front and rear 3D capture, a total of four. I estimated to him that the target buyer for the Hydrogen might really be a majority of low-budget indie filmmakers who’d have valued the extreme portability of a reasonably good stock camera at launch, something to use in a pinch that could have a fighting chance getting color graded to match other RED cameras (or Blackmagic/Sony/Canon/Panasonic log capture). As of this week, subject to change, the promised modular cinema camera attachment is at least 12 months away from release, so it really won’t be a meaningful factor to anyone considering a Hydrogen now. Will the RED’s own new 3D video format be cross-compatible with the Google VR180 format that plays natively from YouTube? Can VR180 content, acquired through camera products like the Lenovo Mirage and Yi Horizon, play straight from the Hydrogen in 3D? What about stereoscopic 360-degree video? But back to the specific question, VR180 files won’t need to be converted into RED’s proprietary H4V file format, and the Hydrogen display will show depth in VR180 files. It does not seem likely that the Hydrogen’s gyroscopic sensors can empower the viewer to pivot around a 180-degree field of view, per the VR180 format’s full capability, and what’s unfortunate about that is, stereoscopic depth in VR180 is harder to appreciate when forced to look only straight ahead into content captured from a stationary camera. As to YouTube playing back VR180 content on the Hydrogen’s display, with depth, Jim sounded a little more optimistic than I think we’ll ultimately see. Deployment of YouTube content is really locked down by Google, and limited to either the Android YouTube app itself, or embedding at a mobile web browser – down to the level of mandatory branding of the YouTube logo visible at all times, hyperlinking to YouTube.com. Unless RED negotiates with Google’s developers for an app update that integrates Hydrogen functionality, it seems to me that the world’s biggest repository of 3D video content simply won’t be accessible on the Hydrogen, short of ripping downloads into side-loaded video files for local playback. RED is of course investing a lot into its online repository of user-generated Hydrogen content, called RED Channel: whether that new platform rises to dominance in the worldwide field, or never has a fighting chance against Google and the like, remains to be seen. But odds are always in favor of the bullies, and RED’s focus on their proprietary file format, not playable at launch on any non-RED devices for even just a stereoscopic experience (e.g., Oculus Go), feels intuitively to me like the undermining of the whole product. I wish that H4V were designed as an additional layer on top of the VR180 format for maximum cross-compatibility. But this is another thing that remains to be seen, and the early adopters are the guinea pigs – I’m one of them, having placed my order inside of the first minute orders got taken. Everyone is bound to evaluate this thing on a few levels, but I’d break it down into three: is it a good phone; how’s the “holographic” display; and how’s the binaural audio? When it comes to the phone itself, these pictures I snapped (lit-up screen was forbidden) speak for themselves. Of course, it’s big and heavy. And the screen doesn’t go all the way out to the edges, clear of any bezel, which is the latest passing fashion that’s really a play for profits by the smartphone manufacturers (do we really care pragmatically?). The main screen looked to me like stock Android, thankfully – no HTC Sense bloat, or the like – and it’s been widely reported that carrier negotiations are coming together, with AT&T and Verizon already on board. I asked them about Project Fi, at least via an extra data SIM, because that’s how I roll (it’s by far the best deal for service, ICYMI) – but while the RED reps didn’t know for sure, they noted that the phone is unlocked (of course). Since Project Fi rides on Sprint, T-Mobile and U.S. West as an MVNO, it remains to be seen, for just one example among the many MVNOs like Straight Talk, etc. My guess is, probably: the Hydrogen comes equipped with internal LTE radios for every major spectrum class worldwide. I was happy to see a USB-C port at the bottom, instead of a Micro-USB hangover that’s honestly extinct by now (seriously, Oculus Go). There was a temporary label for MicroSD at the top of the phone, an audio headphone jack, and the flat multi-connector bus on the back of the phone that will interface with expansion modules many months after launch, well into 2019 if at all. Inside, the central processing unit is a 2017-model Snapdragon 835, which happens to be snappy-ish, but slower than the 2018-model Snapdragon 845 found in today’s Galaxy S9 among others. If you do end up trying to use the Hydrogen as a conventional VR playback device in a viewer, it may not even be able to keep up with today’s baseline spec of 4K 60fps or higher equirectangular video. But straight from Jim Jannard’s mouth, the Hydrogen, at launch, is all about the screen. I showed you that children’s book earlier: to be honest, that’s roughly what you get, were it time-based media (i.e., video). RED is demoing the screen using content from the domain of familiar movies and television shows, such as animated characters and action flicks. Stereoscopic cinematography today tends to be subtler than years past – no more paddleball bouncing straight at you as in Vincent Price’s House of Wax 3D – so the choice to use familiar existing content might have been ill-advised, to really show off the Hydrogen’s capacity for presenting depth. At best, there was a moment when confetti burst into the foreground, and that was awesome; but generally, the depth perception I saw really did approximate those old children’s book panels, with their ridged plastic texture – and just like that, images even bounced a little between angles, stills especially. I don’t think it was a LAUREL vs. YANNY thing with my eyes, either. That 4View-like ability to peek around objects did work, though, differentiating this technology from mere stereoscopic content. But the perceived depth was so limited, that the wow factor wasn’t there. And even inside the dark tent, it looked like the total nits of brightness must be compromised by the “holographic” technology, which makes sense. I saw the total nits of brightness get higher/more normal when leaving the Hydrogen playback app – though as much as I like stock Android, hopefully RED will design a standard “launcher” OS layer that makes the app icons appear raised above a recessed wallpaper (adding related animations with depth, too). 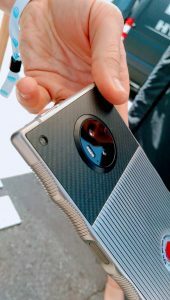 If the “holographic” screen is the Hydrogen’s calling card, that’s probably the right place to consider its $1.2k price tag (or $1.6k if you want a titanium chassis, FWIW). Even if I felt disappointed by the Hydrogen’s screen technology, this is a great example of an inevitable new technology that we’ll all use someday, rolling out as a luxury item in its infancy. Let’s be real: the Hydrogen’s demographic is upper-middle class Americans with disposable income, up to the wealthiest consumers! But so are Elon Musk’s Tesla automobiles, and like that, RED has lots to be proud of: they did this outside the entrenched systems and economies of scale in gigantic smartphone corporations like Samsung, LG, HTC, and Apple (albeit, Apple is always last to adopt newest/best technologies, right?). Modularity can mean that an investment in the Hydrogen will grow with the times; yet that Snapdragon 835 stuck inside might be its Achille’s heel, as the Android OS keeps bloating – something else that remains to be seen. I sure hope that the Hydrogen will launch with Oreo. OK, bonus round. This is a feature that’s honestly not very hardware-dependent, and disingenuous as an exclusive feature. 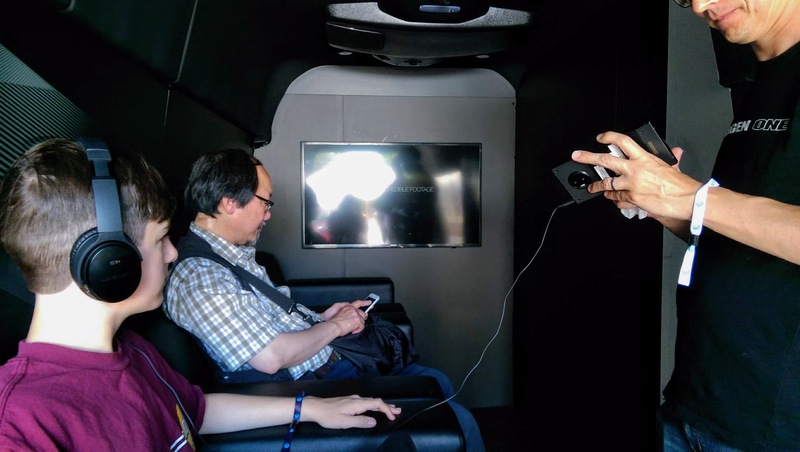 For several decades, binaural audio and Ambisonics in particular has been an available tool for “positional” sound – these days, we’re using it in tandem with VR head-tracking so that sounds really stay where they’re coming from. Keep in mind that the Hydrogen isn’t really interested in 360-degree presentation. So why is it important to hear sounds behind you versus in front of you, when you’re always looking forward? Well, surround sound is a real thing, and filmmakers use it just a little bit for films that we watch straight-ahead. But binaural audio (i.e., simulating surround sound through delivery merely into left and right drivers) is something that thrives in full immersion. Back to the Hydrogen, RED paired their demo tent with a “sound van” seen here, where visitors took turns putting on a pair of headphones wired into a Hydrogen. They used headphones that were honestly pretty lo-fi, and not even circumaural (i.e., not completely covering the ears), thus prone to background interference. I’ve also heard much better binaural audio content, whereas in this case, the positional sound was very rear-heavy with little information from the front. The vitality of binaural audio is ultimately determined right up to the post-production stage, and playback is after-the-fact. The most that a playback device can offer is high-resolution audio for the most faithful reproduction, and it’s true that most smartphones lack that. But there’s nothing new coming out of the Hydrogen sound-wise; it’s all about the content going in. The product does tout an “H3O” conversion algorithm from stereo content, but that’s a fairly random application of directionality compared to the real thing. That said, there are stereo front-facing speakers, and they sound great. It’s something weirdly out of fashion these days in smartphones; I remember how revolutionary it was when the HTC One worked stereo front-facing speakers into the bezel with surprisingly firm bass response, adding so-called “Boom Sound.” Few others followed, and smartphones always sound much tinnier than they should. The Hydrogen gets this right. RED describes their customer service as “white glove,” and they promise to accept order cancellations anytime and even returns after delivery. They are releasing an initial batch of pre-orders (guess that’s me) before going into full production in tandem with telecom carrier delivery via AT&T and Verizon. They say they’re on track for August delivery, but of course (like anywhere), it’s subject to change. I can tell there’s a lot of people in the RED universe who are used to waiting, who will wait as long as it takes. I never thought this would happen, but now I’m warming up to RED. Maybe it’s a hometown thing.